In 1849, Anne Brontë died a devout and innocent virgin. Three days later, she rose from the dead. Now from the jagged wilderness of the Blue Ridge Mountains, to a glittering lair deep beneath the Biltmore Estate, a lonely Nightwalker fights her eternal hunger as she strives for salvation amidst temptation and blood. Gea Haff weaves Brontë biography through this modern gothic tale in Book One of the Brontë Blood Chronicles. For mysterious reasons, Asheville Paramedic Anne Bell never lays down ties and only works the night shift. Deputy Santos knows she's not normal. The new ER doc watches her like a wolf. And the handsome Professor Hardcastle, a Brontë scholar, is on the verge of discovering her true identity. Then just as love blooms in Anne's bloody world, her long-lost sister Emily suddenly arrives, resurrecting memories and bringing her own feral brand of violence to this snow-draped mountain town. Anne's going to need all the help she can get. 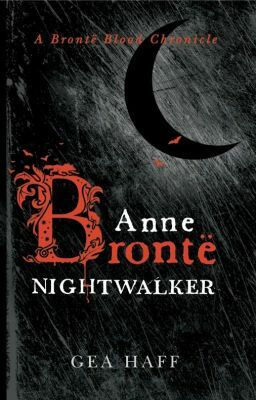 A vicious Alpha predator circles nearby, feasting on the innocent, and he won't stop until securing his greatest prize: Anne Brontë, Nightwalker.